If you are looking for a chainsaw to handle cutting jobs without causing too much pain on your body, then this Black and Decker 20V Max Lithium Ion 8-Inch Chain Saw is worth considering. With the superb comfort features built into this unit, you can use it to get your job done easily and quickly. Black & Decker LCS120 20-volt MAX Lithium cordless chainsaw features wrap-around soft-grip handle to provide multiple gripping positions, which means you can make precise cuts at virtually any angle. In addition, this flexibility also helps reduce fatigue when pruning or trimming high branches or in close quarters. Equipped with an eight-inch reduced-kickback bar and low-kickback chain, this unit delivers great control and stability for both soft and hard woods. The result is that you are able to handle a variety of cutting tasks safely and confidently. 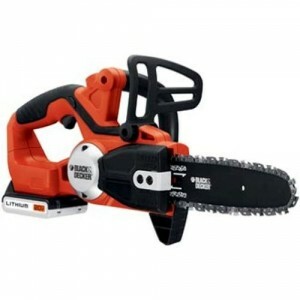 Its eight-inch bar allows you to cut branches up to eight inches in diameter. This Black & Decker LCS120 20-volt MAX Lithium Cordless Chainsaw weights just over 5 pounds, making it ideal for any user.